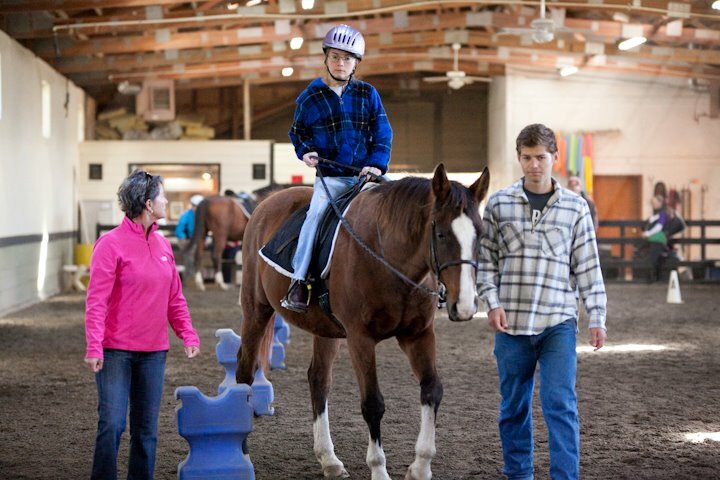 Class activities are designed to challenge and benefit our riders in physical, cognitive and social ways, and are a combination of riding skills and creative educational games. The basic riding skills we teach and develop include: walk, halt, trot, 2-point, turning, barrel courses, cavaletti poles and more. In addition, we strengthen these skills through games such as basketball, beanbag toss, memory, matching and more. For added benefit, we take riders through our Sensory Trail – an interactive learning trail ride within the wooded acres of Misty Meadow Farm. Despite the underlying goals of cognitive, physical and social development, the activities are FUN and encourage independence and friendship as well. Below is a list of some of the activities we do with the riders. Each activity focuses on specific therapeutic benefits, which are then built upon each consecutive week throughout the season. All classes begin with a series of exercises to warm-up the riders muscles and create an awareness of balance. Build-A-Bunny is a fun, creative activity in which riders earn individual pieces of a bunny (i.e. nose, tail, ears) by completing specific riding tasks. At the end of the exercise, the rider has all the pieces necessary to create a paper bunny to take home with him/her! This activity is designed to work on recognition, eye-hand coordination and communication skills, as well as improve basic riding skills. Drill Team activities encourage riders to work on memory skills, team-building, communication and patterns. Partnered with other riders, the class designs a drill pattern which all complete together, developing a sense of accomplishment and completion of a big, collaborative task. Through proper reining tasks (left, right, halt), this activity is designed to work on eye-hand coordination by placing rings on poles. Trunk flexibility is improved by crossing the midline with rings, and accomplishment is measured through the accurate reining of the horse into position. By steering through a course of barrels, riders earn visual cards that they match with other images. This activity is designed to increase memory retention skills, muscle tone and control and social interaction. Focus is placed on eye-hand coordination and communication skills. By riding through an imaginary bowling lane, riders develop muscle control through the release of the ball towards the pins. This activity is designed to reinforce basic math skills and proper reining. Each rider is challenged with a variety of skills such as eye-hand coordination, cognitive balance, muscle control and spatial orientation. Riders select a colored ball from the starting line, and ride through the pattern until they can match the ball color to a colored bucket. This activity is designed to benefit spatial orientation, depth perception and eye-hand coordination. Balance, muscle tone, and muscle control are stimulated through head and/or trunk rotation. Cognitive motor planning and timing are exercised through distance, speed and direction of activity. Various shapes, sizes and textures are used to provide different tactile experiences. Through creative and interactive exercises, riders play dress up with their horses. Using a variety of beads, bows, and other items, riders place the elements on their horses, followed by completing a riding-specific task. This activity is designed to increase attention span while also improving self-esteem. Eye-hand coordination, fine motor skills and gross motor skills are also utilized in this game. Riders complete a course of obstacles which challenge their minds and bodies. This activity is designed to reinforce directional skills (reining) while engaging large and small muscle groups, building stamina, increasing attention span (cognitive) and self-esteem (success). Riders steer their horses through a course of color-coded ground poles, each representing a specific task (speed up, walk, 2-point over pole, halt, etc.). This activity is designed to challenge the rider both physically and mentally. This activity is designed to keep the rider fully engaged for maximum success. Emphasis is placed on maintaining control while staying focused on the task at hand from beginning to end. This activity explores the concept of cause and effect. Riders can discover the impact they have on controlling and directing their horse by proper use of the reins, position of their body and voice commands. Riders spend time grooming their horses, learning the value of step-by-step processes and personal hygiene. Emphasis is placed on the concept of hard and soft brushes, as well as overall care for another. This activity is good for muscle control, eye-hand coordination and memory recall. To learn more, or share an idea for a new activity, please click here to contact us.